A Midwinter Concert Featuring Northern Michigan Singer Songwriters Several of our favorite Northern Michigan Singer/songwriters have put together a concert guaranteed to shake you out of your mid-winter blues and add a little musical sunshine to your life. Artists include Kevin Johnson, Eliza Thorpe, Indigo Moon ( Lee Anne Whitman and Jeff Lange) and Lara Fullford. 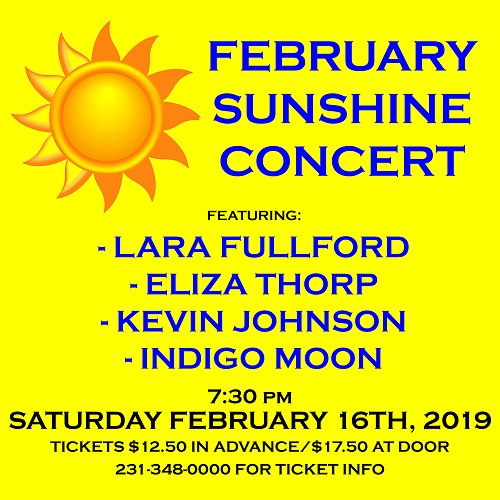 Several of our favorite Northern Michigan Singer/songwriters have put together a concert guaranteed to shake you out of your mid-winter blues and add a little musical sunshine to your life. Kevin Johnson has been steadily honing his songwriting and performing skills and has become an important part of the vibrant Northern Michigan music scene. Drawing on a wealth of musical influences and life experience Kevin’s Americana songwriting style touches on a wide variety of topics including love, loss and self discovery. sing a skillful blend of keyboards and vocals up and coming Northern Michigan singer/songwriter Eliza Thorp leads her audiences on musical journeys with her songs about home, travels and natural landscapes that always inspire. Indigo Moon is Lee Anne Whitman and Jeff Lange. Take a mix of exceptional guitar work, beautifully blended vocal harmonies and inspired song writing and you’ve just scratched the surface of Indigo Moon. This musical partnership is an audience favorite at venues throughout Northern Michigan. Performing original and cover music from a wide variety of Americana, folk and adult contemporary artists Indigo Moon always delivers a musical delight. ara Fullford Lovingly referred to as the Queen of the Inland Waterway by her fans Lara is one of the best songwriters anywhere and is popular with fans of all ages. She has been performing since the age of 15 including appearances at the popular Blissfest Music Festival. Playing either guitar or piano Lara’s music is a pleasure not to be missed.